The excitement is building around central Iowa for Saturday’s opening day of the 2017 Des Moines Farmers’ Market. 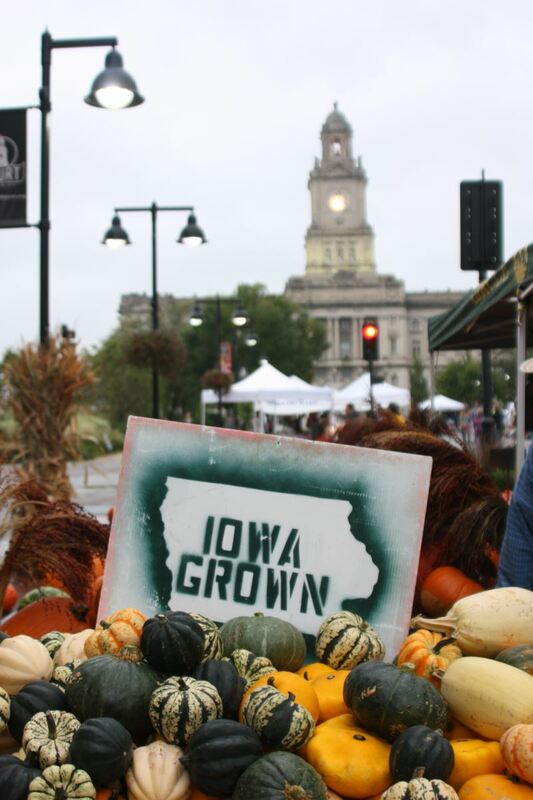 Fresh and Local: urban and rural communities coming together, 300 vendors helping to nourish the community with locally-grown produce and flowers, farm fresh eggs and cheese, locally produced baked goods and Iowa-raised meat. The encounter at the Des Moines Famers Market also provides experiences to enjoy live music and entertainment by local artists. It has been said that every faith community has what it needs to thrive; our mission is to call forth those people and resources. This is precisely what we’re praying to do here at The Well. Back in January a book came into my life that rocked my world, I Believe in Love: A Personal Retreat Based on the Teaching of St. Thérèse’ of Lisieux by Fr. Jean C. J. D’Elbee. It’s a spiritual classic beloved for its easily digestible teachings from St. Thérèse’ of Lixieux. For the record, I’ve never developed a strong devotion to St. Thérèse; I’ve struggled to read her works and “get” her spirituality. Thanks to how Fr. D’Elbee compiled her writings into a reader-friendly retreat format, I found myself often exclaiming, “Aha! Now I understand!” Collectively, the messages contained in the book focus on God’s love and the confidence in Him it should inspire in our souls. After reading it, I had a very strong call that Jesus wanted these messages to also be proclaimed at The Well’s 2017 summer gathering. Now it was up to the Holy Spirit to shine His light on the women who could passionately deliver. One by one, it happened. The Holy Spirit starting revealing women to share this message … His message. Turns out some women had already read the book and were equally moved as I. Others have since read it and now understand why the Lord wants this message shared. A few weeks ago I hosted the speakers in my home for an evening of prayer and faith sharing. My cup was full after hearing each woman share early ideas for their talks. It is quite humbling to witness how each woman has submitted to the Holy Spirit and is allowing His words to guide their talks. I am proud of them and very excited to see how their messages will bless attendees of The Well this summer. Early bird registration continues through May 22! The second annual Summer at The Well women’s gathering takes place on Saturday, June 24 at St. Thomas Aquinas Catholic Church in Indianola. It’s a day full of faith, fellowship, and fun with inspirational talks, uplifting praise and worship music, individual prayer in our Adoration chapel as well as communal worship at Saturday evening Vigil Mass. A box lunch, afternoon snack break, and buffet dinner are all included with registration. Early bird registration rate is $60 through May 22; $65 after. Scholarships are available for those in need. Attendees must pre-register prior to June 9. Registration details and more information on the speakers for 2017 Summer at The Well are available here.